July 2004, Amman, Jordan � Emergency Room, dislocated left shoulder playing basketball. March 2005, Nassau, Bahamas � Emergency Room, dislocated right shoulder going down a waterslide. January 2006, New York City, N.Y. � Emergency Room, dislocated left shoulder reaching for the phone. February 2008, Amman, Jordan � Emergency Room, dislocated right shoulder, failed attempt to throw a snowball! It is said you only appreciate something once it�s gone, and that�s exactly what happened to me. It was taken away from me at the age of 18, my youth, that is! That pretty much sums up the story of my life between the age of 18 up until I met Dr. Brian Cole. It became comical in a way. Most of my events were disrupted by going to the Emergency Room (of whichever city I was in at the time) to put my shoulder back in its socket. It wasn�t about the pain or the discomfort I was enduring at the time; to me all of this is bearable. It�s the fact that I couldn�t participate in the activities that I enjoyed (basketball, boxing, tennis, being a normal, irresponsible 18 year old!). September 2009, Chicago � Dr. Cole examined my shoulder and said: �I go in from here, do this, and do that, with minimal invasion. If you don�t go back to doing whatever it is you like doing, it means I failed.� That next morning he operated on my right shoulder and then some seven months later operated on my left shoulder. After a year of rigorous training and strengthening, Dr. Cole was true to his word, my recreational life was back to normal. I could participate in any sport/activity I could think of. 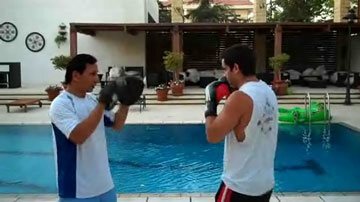 Only a few years ago I couldn�t reach out for the phone to change a restaurant reservation, and now eight months and counting I�ve been training boxing three times a week! This major turning point in my life made me more appreciative; I play sports six times a week and lead a very healthy lifestyle. The latter wouldn�t have been possible had I not seen the �other� side. Only a few people get second chances. Thanks to Dr. Cole, I was one of them!